Hummingbirds, rainforest hikes and rum punch before noon – the temptations of the Carribbean well and truly win over this traveller. We wake in an expanse of crisp, white sheets. Our four-poster bed, draped with mosquito nets, looks like the resting place of a fairytale princess, but it’s the view outside that takes my breath away. Bottle-green foliage covers volcanic mounds rising up from an azure sea. The Charles Rennie Mackintosh-inspired balcony overlooks the marina and to the west, white, sandy beaches. The air is heavy with humidity and we’re enveloped in warmth quite unlike the fickle and often brisk British summertime. The foreground is a mass of hibiscus bushes, attended to by hummingbirds and the friendliest of lizards, while improbably agile pelicans soar overhead. 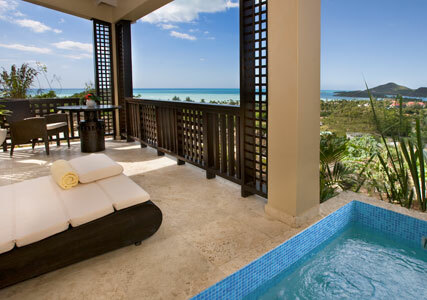 This is Sugar Ridge, Antigua– the two-year-old luxury resort that shunned the beachside locations of the rest of the island’s hotels and instead made its home on the hillside amongst the Caribbean’s lush tropical rainforest. This affords guests stunning views, a sense of retreat as well as, crucially, a breeze. With temperatures topping 30 degrees C, the change of air along with our room’s private plunge pool is greatly appreciated. Everything has been thought of here – from the colonial style ceiling fans on the balcony to keep you cool to the iPod docking stations in every room, WiFi and LCD TVs for those seeking still further stimulation. The manager, Keith, is an expat who came for a season nine years ago and never left. It’s a story you hear a lot, with British, Israeli and Australian accents regularly heard in shops and restaurants. They all say the same thing: ‘We fell in love with the place’. Antigua is infectious and by day two we’re on local time – watches left in our room, walking at an altogether slower pace than we would at home and thinking nothing of accepting the offer of rum punch before noon. We eat when we’re hungry and sleep when we’re tired, be it at 7.30pm when the sky is already blissfully pitch black and star-studded, or at 2am after a night of local hospitality on one of the islands best beach bars (Dennis’s, since you ask) as you listen to the cicadas’ song, which lasts all night. 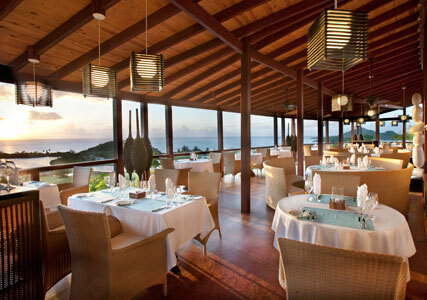 The food at the resort and elsewhere is good, and plentiful – at its best when dishes are locally inspired, like the catch of the day or plantain. Sugar Ridge offers gourmet dining at Carmichael’s restaurant and their Sugar Club eatery does a great line in classic American dishes. 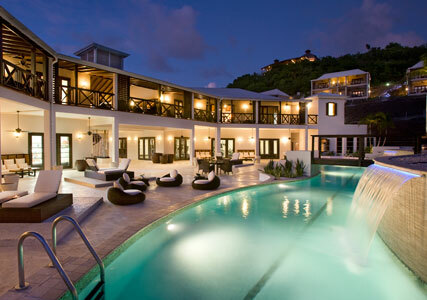 Once we can tear ourselves away from the food (so good), we treat ourselves to a massage at the impressively equipped Aveda spa (the first in the Caribbean) before relaxing around the pool. When the beach beckons, Vaughan, local naturalist and Sugar Ridge’s in-house man about town, is on hand to drive us to picture-postcard stretches of white sand as well as giving us the low-down on the best places to pick our own mangos or see the island’s endangered racer snake. For the more active holiday maker, there’s also a state of the art Cybex gym in the resort (I’m ashamed to say we didn’t make use of this) or excursions around the island that can be booked at the front desk or in advance via your travel company – in our case, the excellent Turquoise Holidays. From kayaking through the mangrove swamps (smelly, but beautiful), to ziplining through the rainforest canopy or taking a hike around the rocky cliff-tops, there’s plenty to keep the more intrepid traveller (my husband) busy. As the sun sets, Sugar Club has live music and on Saturday, transforms into the island’s hottest night spot. Dancing under the stars, rum punch in hand, I start to think that I could get used to this. By the time we’re packing to come home, I’m planning my next trip already.